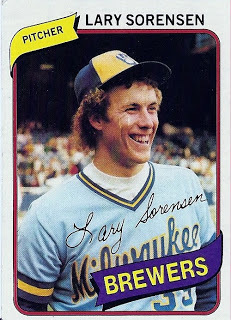 Righty pitcher Lary Sorensen was born on October 4, 1955, in Detroit, Michigan. He was named for pitcher Frank Lary, hence the spelling of his first name. Sorensen grew up in Michigan and stayed there to attend college at the University of Michigan in Ann Arbor. The Milwaukee Brewers drafted him in the 8th round of the 1976 MLB June Amateur Draft. From there, Sorensen was fast-tracked to the majors. He started off with the A- Newark Co-Pilots, and then made the jump to the AA Eastern League Berkshire Brewers. By the end of the 1976 season he had appeared in 20 games, 14 of which were starts. He logged 116 innings and posted a 2.64 ERA, which earned him a promotion to the AAA Spokane Indians for the 1977 season. At the time of his callup, the 6-2 200 lb Sorensen had started 12 games for the Indians and completed 5. He threw 72 innings, gave up 79 hits, and carried a 4.62 ERA. To his credit, he had only given up 3 home runs over that span. Sorensen was just 21 years old when he made his big-league debut at Milwaukee County Stadium on June 7, 1977. Only 9190 fans were in attendance to see the 27-27 Brewers take on the 28-23 Baltimore Orioles. Sorensen lasted 6.1 innings, giving up 7 hits and 4 runs. He didn’t figure into the 7-6 win that Milwaukee pulled off in the bottom of the ninth inning. That same day the Brewers picked a kid named Paul Molitor in the first round of the amateur draft. Sorensen was back on the mound on June 11 at County Stadium, but didn’t fare well against the Kansas City Royals. He again pitched into the seventh inning, but gave up 7 hits and 5 runs. The Royals blanked the Brewers 6-0 that day, and Sorensen took his first career loss. Milwaukee took on the California Angels in Sorensen’s next start. As in his debut, he didn’t get a decison. Milwaukee lost 7-5 in ten innings. This time out, Sorensen lasted into the 8th inning, giving up 8 hits and 4 runs. With three starts under his belt, Sorensen had thrown 19.2 innings, allowed 22 hits and 13 earned runs. His ERA was a whopping 6.09 to that point. He wasn’t about to be pulled from the rotation, but he really needed a big win to turn things around. That win came on Friday, June 24, at County Stadium. Sorensen tossed a dominant complete game against the Seattle Mariners, leading Milwaukee to a 7-1 win. His ERA dropped to 4.25 as a result. Seattle managed just 4 hits in the game. Coincidentally, Paul Molitor signed his contract with the Brewers that day. Sorensen closed out June with a gritty 1-0 win over the Minnesota Twins at Metropolitan Stadium. He faced a tough lineup that included future Hall of Famer Rod Carew and future Brewer teammate Larry Hisle. Hisle became the first big name free agent to sign in Milwaukee after the season ended, and this helped Milwaukee become a place where other stars wanted to play. It was Hisle, in fact, who chased Sorensen from the game in the 9th inning. Sorensen scattered 6 hits and gave up 3 walks, but always worked out of trouble. The final hit off him came from Hisle – a single to lead off the 9th. Lefty Bob McClure came in and was able to induce a groundout to force Hisle out at second base. Righty Bill Castro followed McClure and recorded the final two outs to preserve the victory for Sorensen and pick up a save. Sorensen found himself with a 2-1 record and a 3.35 ERA. He ended 1977 with a 7-10 record with a 4.36 ERA. He had pitched 23 games, 20 of which were starts – and completed nine of those games. Sorensen logged 142.1 innings and allowed a little over a hit per inning, but walked just 36 hitters. In fact, over his 11-year career, Sorensen averaged just 2.084 walks per nine innings pitched. He was off and running, and the best was yet to come. The 1978 season was something special for both Lary Sorensen and the turned around Brew Crew. He posted an 18-12 record with a 3.21 ERA, slotting in perfectly behind Mike Caldwell (22 wins) in a rotation that desperately needed a couple of aces at the top. Jerry Augustine and Bill Travers also posted double-digit wins, while the fifth spot in the rotation was quite unstable. Andy Replogle, Eduardo Rodriguez, and Moose Haas all made starts with varying degrees of success. What Sorensen and Caldwell did to help their team finish 93-69 cannot be understated. Along the way to a great finish, Sorensen also made an appearance in the All-Star Game. Jim Palmer started for the American League and was roughed up early. After Matt Keough relieved Palmer, Sorensen came in and pitched three innings. After allowing a leadoff infield single to Larry Bowa, he retired nine batters in a row: Reggie Smith, Pete Rose, Joe Morgan, George Foster, Greg Luzinski, Steve Garvey, Ted Simmons, Dave Winfield, and Bowa. The AL eventually lost, but Sorensen’s effort was something to admire. 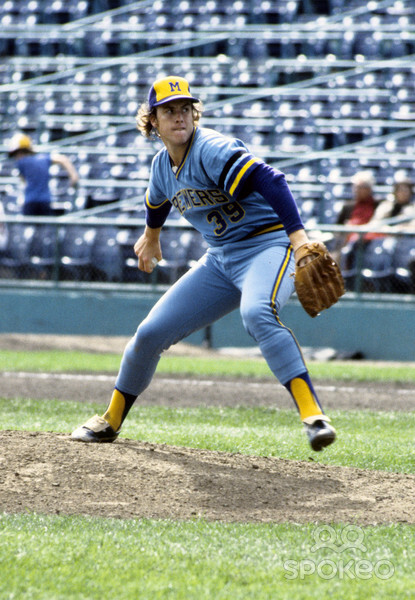 He threw 235 innings in 1979 and his ERA increased to 3.98, mostly due to giving up more home runs (30) than in 1978. Certainly no one could complain about Sorensen’s 15 wins in 1979. And he did rank fifth in the AL in complete games with 16. He had also finished fifth in complete games in 1978 with 17. In 1980, Sorensen pitched in 35 games (29 starts) and compiled a 12-10 record with a 3.68 ERA. He fell just short of throwing 200 innings while giving up 242 hits, but lowered the home runs allowed to 13. Yet Sorensen’s days in Milwaukee were numbered. General Manager Harry Dalton was in search of a move that would elevate his team in the highly competitive AL East division. Brewers fans that were around at the time and remember Sorensen usually don’t bring up his name without mentioning “the trade.” It was the deal following the 1980 season that sent Sorensen, Sixto Lezcano, David Green and Dave LaPoint to the Cardinals in exchange for Pete Vuckovich, Ted Simmons and Rollie Fingers. Later the Cardinals flipped Lezcano and Sorensen in deals for the unrelated Ozzie and Lonnie Smith. Brewers owner Bud Selig called it probably the best swap made in the history of the franchise. It was a trade that set both teams on a path to meet in the 79th World Series in 1982. Meanwhile, Sorenson went on after St. Louis to play for Cleveland, Oakland, the Chicago Cubs, Montreal, and San Francisco. His career lasted 11 years, but unfortunately, he was never able to match the success of those early years in Milwaukee. Sorensen had some alcohol problems that came to light near the end of his playing days. He continued to battle with alcohol after retiring from the game and starting a career in broadcasting. These days he is an announcer for Wake Forest baseball and also recently worked for the Winston-Salem Dash (Chicago White Sox Class High-A team in the Carolina League). When he was hired, he told his new employers they could Google him for all the details of his battles with alcohol. I’ll let you do the same. 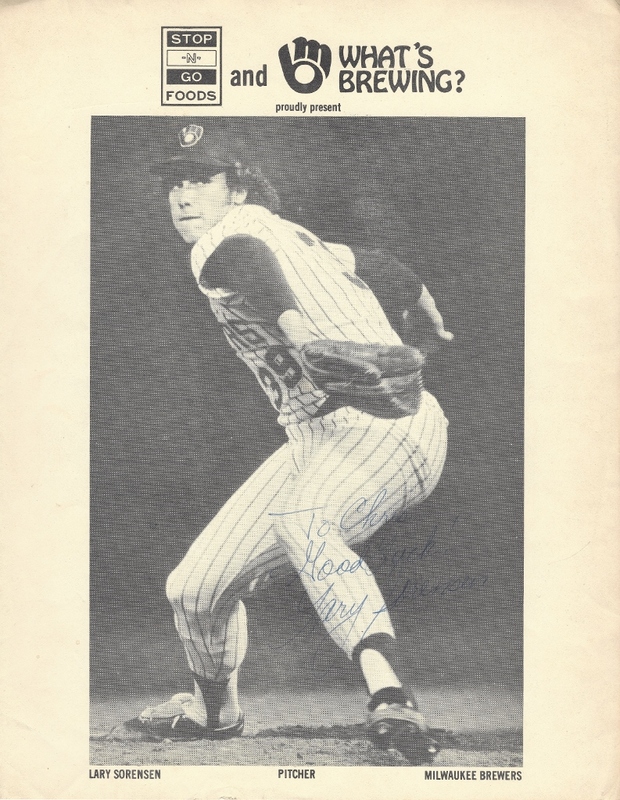 Lary was the first big leaguer I ever met and got an autograph from – but that’s a story for another blog post!